I biked to Madison and Bouckville this morning. Those of you who know Hamilton and surroundings have figured out that I’m a pretty lame biker; rarely do I ride more than 20 miles in one go. It’s not because I can’t, but rather because I have many things on my bucket list, especially for the finite hours I have in Central New York. I hate to spend too much time away from the fam. If Mom or Dad or Christopher or Putney would ride with me, then athletic sight-seeing could be a social activity, and I wouldn’t fear missing funny happenings back at the Tanner Mansion. While riding yesterday, I noticed a road out of Bouckville, Crow Hill, that I had never been up, so I checked it out, and learned that it would make a good and hilly 18.5-mile loop. I was going to leave at 6:30 AM, but it was 55 degrees outside, requiring a long-sleeve jersey to start, and then after a while I might be too warm. I headed out into a perfect morning when the temperature hit 60º. Hamilton is in the Chenango Valley; from home, it is uphill almost everywhere. The climbs on this route aren’t steep or large, but Crow Hill is prominent. On the way up, I passed a small farm with a surprisingly large diversity of species: donkeys, goats, geese, ducks, chickens. When was the last time I saw a donkey on a farm? I couldn’t remember. Crow Hill has attracted the wind energy business. Up there in the farm fields are several turbines, over 300 feet tall. The New York Times reported a few years ago on a huge wind farm on Tug Hill. 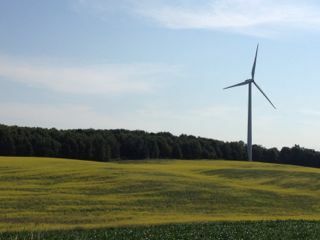 Some neighbors complained about the noise of the windmills. Atop Crow Hill, I stopped to listen, and barely heard anything. On the plus side aesthetically, the slow, silent spinning of the huge blades evokes a Zen-like calm. The down side is that the towers are so huge that they make mature trees and the area’s grand hills look like the topographic equivalent of toy poodles. I saw only one person while up on the hill, driving. Biking in vacant areas makes it easier to find solitude. Biking in vacant urban areas can sometimes lead to a hold-up at gun-point followed by being chopped up into bite-size pieces and tossed in the river. This morning’s fresh-air pee is a perk of rural living. Chicago has no hills. A parishioner at my new church job who regularly walks several miles around Hyde Park commented on the hill at South 47th Street on the Lakefront Trail. I said nothing, because I really like this woman, who is also from the East (where there are real hills), but that “hill” (the approach to the pedestrian bridge over Lake Shore Drive) is about 30 feet high. My legs, too, have been forgetting what’s required to gain elevation. Today’s ride is the reminder that, while here, I need to climb hills. Lest legs forget. Returning from Germany today on a high-carbon diet, I decided to watch Gas Land, a 2010 documentary about the natural gas industry, the process of hydraulic fracturing (AKA “fracking”) used in natural gas extraction, and the health and environmental crises rippling out from the increasingly-pervasive gas wells sprouting like weeds around the USA. Do Washington’s Metrobuses, proudly proclaiming “powered by clean natural gas”, lie to us? Energy has been on my mind throughout the past nine days, as I have wandered the streets of Munich, where gasoline sells for the equivalent of US $9.00 per gallon and where bicycle lanes and public transportation are ubiquitous and popular; noted from several train windows tile roofs overlaid with solar-panels all over the Bavarian countryside; ridden a jet-powered tour boat up an unnaturally fast river in Salzburg; and read of a glacier in the Alps covered by an enormous tarp each summer the past few years to minimize its accelerated wasting as our little ball of a home warms up. The young filmmaker, Josh Fox, responsible for Gas Land lives in Northeastern Pennsylvania, not far in miles or culture from my homeland in central New York – a rural, hilly, green-in-summer, white-in-winter, economically-struggling area populated by diverse people who love their homes yet face difficult choices to earn a living where progress has yet to arrive or has already passed by. The scenes of forests and streams that bookend his travels through Gas Land – all around the central and western United States – made my heart beat a little faster. We both grew up atop the Marcellus Shale, a huge rock formation stretching from central New York south through several states, and one of the richest repositories of natural gas in the world. He, like I, probably had no idea about this mother lode of fossilized energy until recently, when the “FRACK NO” signs began appearing on neighbors’ lawns. As the film advanced and the toxic effects of the drive to slake our unquenchable thirst for fossil fuels became more vivid, I felt sick: both heartsick and slightly nauseated, hearing person after person talk about how they and the ones they love, exposed to toxins by the gas industry, have lost their sense of smell, their ability to taste food; how they have suffered dizziness, mysterious pains all over their bodies, or neuropathy; how birds, frogs and rabbits have died from exposure to volatile organic compounds (VOCs) bubbling up through stream beds since fracking began nearby; how wells have sprung up on their land because they don’t own the mineral rights to what lies below their homes; how cattle drink contaminated water and eat grass poisoned by chemicals illegally dumped on the ground or rained back down on it from evaporating tanks. The ranchers’ herds and livelihoods risk cruel and selfish death. Contaminated wells are supplanted by reverse-osmosis filtration systems or deliveries of water by truck, presumably at great cost and yielding yet more air pollution. The cattle, the wildlife, however, have no trucked-in water supplies. How will they fare? This blog sprang mostly from my cultural curiosity, an explorer’s lust to see the world and know its inhabitants and their distinctive approaches to surviving and thriving. But my travel is a costly luxury, and much of its cost is, or will be, borne by those whom I will never meet. Do the traveler’s and the host’s increasing understanding of, and appreciation and compassion for the other exceed the environmental cost spread across the globe? The now-famous polar bear, starving as the Arctic ice melts beneath this jet’s contrails, doesn’t have a voice in that calculus. As I jet across the Atlantic, how can I take responsibility for the thousands of gallons of fuel I am passively consuming? How can I repair the damage done by the tons of carbon dioxide pouring out of these enormous engines? How much of the blanket spread over that ancient glacier in the Alps do I own? I am stopping off in Central New York, my homeland, briefly, en route to where I live, and as always I will want to stay longer where the sights, sounds, smells, tastes and touches reconnect to something deeply spiritual within me. During Gas Land, I though with frustration and anger of how much pressure the energy industry is putting on New York State and its communities and its citizens to develop the huge gas reserves below my home. Those streams and trees in the film look just like the ones I have walked and biked and waded and hiked and picnicked and skied and sledded by and through throughout my life, and I was saddened to envision them fouled by greed. Some of our neighbors see dollar signs in the rock beneath. As an undergraduate geology student, I learned about the Marcellus Shale, about its ancient secrets, its record of the previous “landowners” and of the effects of wind and water on the land: sediments, ripples, fossils. I don’t recall a single mention of natural gas. Now, it seems that it’s the only thing that matters about the Marcellus Shale. I fight back a few tears as I think about how friends and family and neighbors in Central New York will be affected by the toxic stew that will bubble up from the earth, spoiling the pure water, fouling the clean, sweet air. In a landscape still populated by more cows than people, where old wooden barns and houses call out to painters and poets to tell their story of melancholy and beauty intertwined in sweet, sad marriage, I ask, is this not worth nurturing until we can fly, drive, heat, cool and cook more gently?